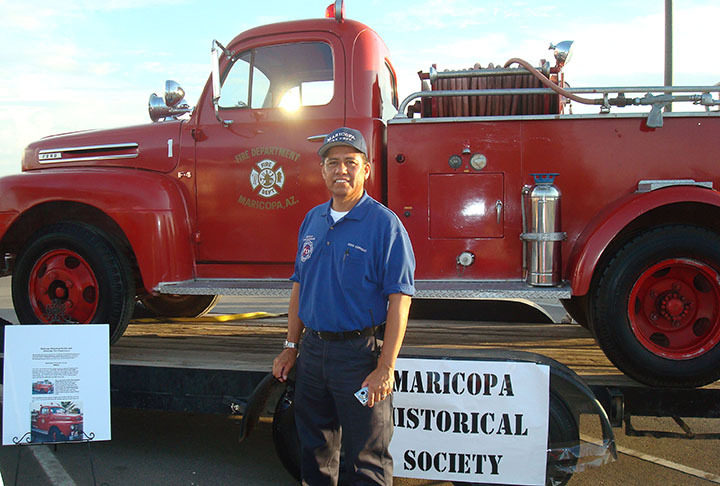 City of Maricopa Fire/Medical Deputy Fire Marshal (and former Maricopa Fire Department chief) Eddie Rodriguez shows off the department’s 1940s Ford/Howe pumper truck. The then-volunteer fire department was started in 1959 by Don Pearce and others, and the pumper was its first fire truck. It served for nearly 30 years before being retired in 2005. It has since been put into working order for special events. This item appears in the May issue of InMaricopa.